YOUR HOW-TO GUIDE TO THE HOTTEST AND TRENDIEST HAIR LOOKS! 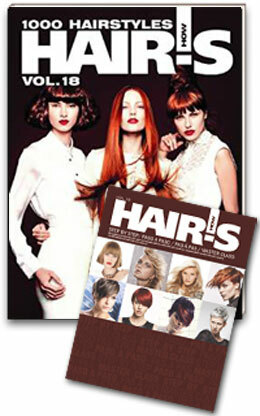 Hair's How styling books spotlight a collection of cutting-edge looks for women and men. They feature a portfolio of elegant, innovative hairstyles for weddings and other festive parties. 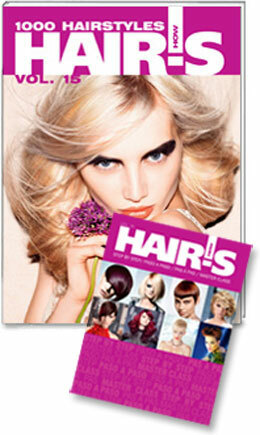 Inside, you'll discover technical manuals for stylists--both professionals and students. It's time to get your hands on the latest and greatest hairstyles! Short, Medium, Long and Party haircuts for women and men, African Americans and Caucasians, teens and seniors. 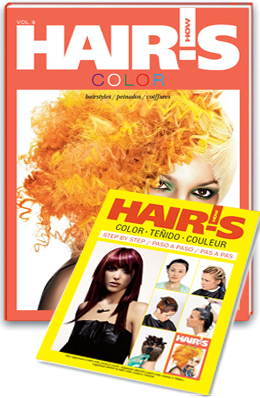 Uncover the latest techniques for styling, coloring, highlighting and perming. 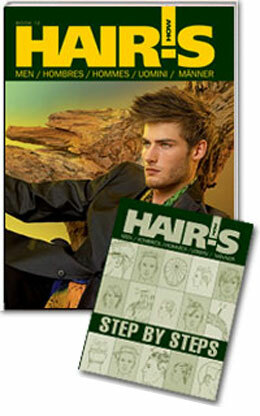 Each Salon Hairstyling Book comes with step-by-step instructions. 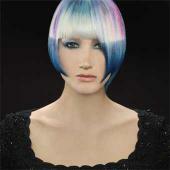 Hair's How hopes you will find your shopping experience enjoyable and rewarding. Happy shopping! BONUS: Buy any book and get iPad/iPhone & Android edition FREE! The hard cover edition is offered in English, Spanish, French, German and Italian. ENJOY! Discover our vast collection of 153 hairstyles for men created by leading top stylists. ● 153 Hairstyles from leading world stylists. HAIR S HOW gets better all the time! Well done and keep up the good work. 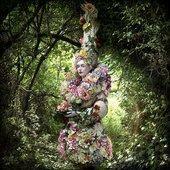 --Antoinette Beenders, Aveda. 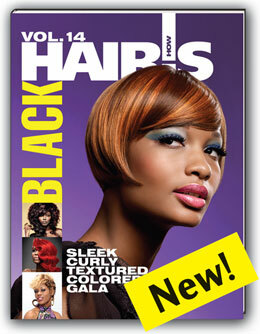 Its glossy, beautiful and reflects the continuing change within the international hair industry. --Trevor Sorbie, MBE, London, United Kindom. "WEDDING," the book + FREE technical booklet "WEDDING, step by step"
The hard cover edition is offered in English, Spanish, German and French. ENJOY! Find 187 most interesting and actual bridal looks from the world's best hairdressers. LEARN! This instructional "WEDDING" booklet will help stylists to interpret many of the updos featured in WEDDING Styling Book. Today we are proud to present the new book "Wedding". A wedding is a vital event in a woman's life, and a wedding hairstyle is the top of a hairstylist's skill. On Wedding pages you will find 187 most interesting and actual bridal looks from the world's best hairdressers, make-up artists and stylists. There is no doubt that the book of wedding looks will be a great assistant for both hairdressers and clients. ● 187 wedding hairstyles for every tipe of hair from leading world stylists. This instructional booklet will help stylists to interpret many of the updos featured in WEDDING Styling Book. ENJOY! Discover astonishing collection of the 197 works by world-renowned artists who are devoted to one subject: COLOR. All images are conveniently sectioned for blonds, brunettes and redheads. There is also a section devoted to creative colors for those who embrace the newest high-fashion looks, including pastels of every hue. 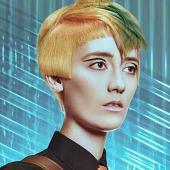 ● 197 color ideas from leading world stylists. The Free Supplement, which is separate from the COLOR book, features 21 color step-by-steps in a clear and concise format. 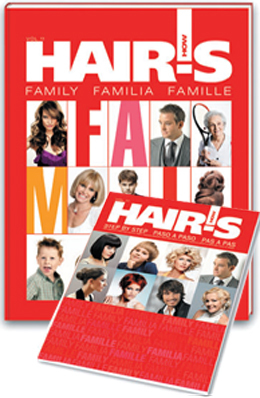 In this book, you can explore a variety of styles that are ideal for all hair lengths and types�including short, long, curly, straight, obedient, and rebellious. ENJOY! MUST HAVE for every woman!!! 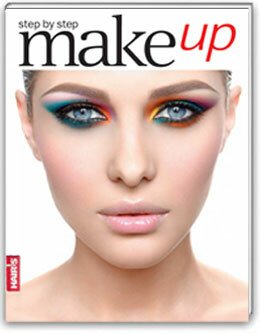 This colorful photo book includes a fabulous collection of 50 different Make-up Step-by-Steps created with the artistry of make up in mind. LEARN! Each step-by-step instruction is accompanied with before and after photos, detailed text descriptions and photos of each step. Adapted to everyday life, you will find only truly wearable looks for women. This colorful photo book of captivating make up step-by-steps - is a new project presented by Hair's How and artistic duo Lepier. In fact, most of the women featured here are ordinary beauties rather than professional models. Adapted and tailored to everyday life, you won't find any over-the-top looks. Hair's How has done its best to inspire aspiringmake up artists to take his or her brush in hand and get to work! Good luck! ENJOY! The release of "1000 Hairstyles", the Book marks the first time that HAIR's HOW presents a complete collection of 1,000 hot hairstyles that have emerged from the portfolios of the world's topnotch hairstylists. Inside you'll discover a range of styles for all hair types and lengths, including short, long, straight, curly, obedient and unruly. Regardless of your varied clientele and their diverse needs, this book will undoubtedly become your go-to guide and most widely used resource. The style savvy hairstyles presented in this complimentary "1000 Hairstyles, step-bystep" book enable both professionals and beginners to truly master their craft! To recreate the hot hairstyles featured, just follow this simple guide! ENJOY! This compelling 120 page photo book features a complete collection of 151 chic styles to suit a wide range of African American beauties. LEARN! Inside, you'll find a vast collection of high-fashion looks from straight and curly to sleek and textured. From innovative updos to simple short looks and wild, flowing manes, Hair's How, Vol. 14: Black has it all! ● 151 Hairstyles from leading world stylists. "MEN," the book + FREE technical booklet "MEN, step by step"
The hard cover edition is offered in English, Spanish, French, German & Italian. ENJOY! From some of the world's top stylists, discover our vast collection of 195 hairstyles just for him. LEARN! 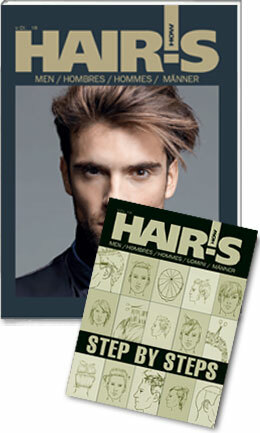 Our complementary "MEN" Step-by-Step booklet refashions the latest styles spotlighted in the "MEN Hair Styles" book. 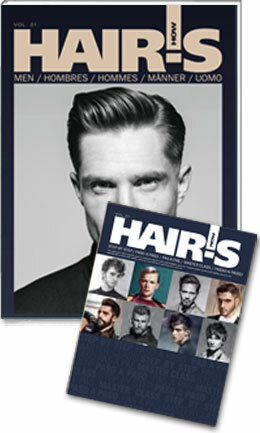 This collection of nearly 200 men's hairstyles expands HAIR'S HOW's series of helpful styling books. The images featured in "MEN" were created by some of the industry's brightest and most renowned stars. This new book addition features the season's latest commercial cuts, hottest colors and most innovative styling techniques. This helpful instructional booklet comes with the "MEN" book and aims to help stylists interpret some of the styles featured in the book. Each step-by-step instruction is accompanied with before and after photos, detailed text descriptions and photos of each step. ENJOY! Discover wedding collection of the 100 most beautiful bridal images. from leading world stylists. LEARN! 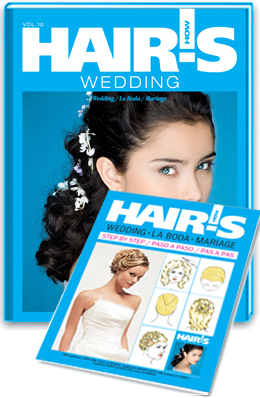 Our complementary "WEDDING" Step-by-Step booklet interprets the wedding styles featured in the "WEDDING Hairstyles" book. 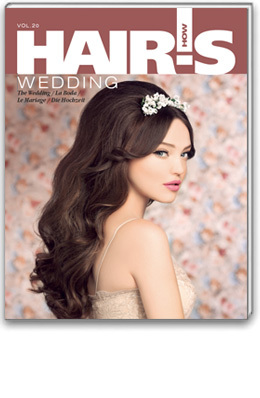 This comprehensive "WEDDING" book, which features 100 hot hairstyles, joins HAIR's HOW's series of styling books. ● 100 wedding hairstyles for every tipe of hair from leading world stylists. This instructional booklet aims to assist stylists in interpreting many of the elegant updos that are featured in the "WEDDING" book. LEARN! The style showcase is conveniently arranged in 4 easy-to-follow sections for short hair, medium hair, long hair and gala looks. The hard cover edition is offered in English, Spanish and French. 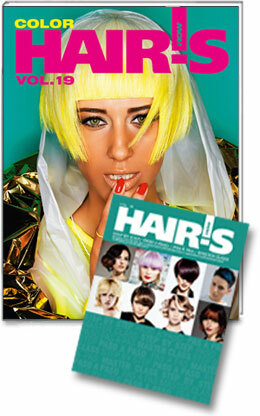 This glossy photo book starts HAIR'S HOW's comprehensive series of professional styling books. 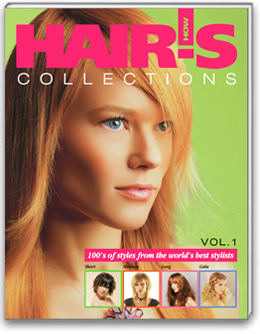 This hairstyling book presents 130 of the best styles that hail from the latest hair collections from the portfolios of top hairstylists worldwide. Inside you'll discover a variety of styles for all hair lengths and types, including short, long, curly, straight, obedient and rebellious.